Ultra HD with wide color gamut, HDR and higher frame rates delivers an immersive, real-life video experience that combines higher resolution with more color, brighter highlights, detailed shadows and motion detail. ARRIS is helping service providers to deliver Ultra HD, with solutions that span transcoding, video processing and customer premises equipment. With its vastly improved resolution, color, contrast and motion dynamics, Ultra High Definition (UHD) video with wide color gamut, High Dynamic Range (HDR) and higher frame-rates offers an immersive, realistic television experience that consumers desire. The transition is happening fast, with more UHD content being produced and distributed, and more 4K HDR televisions available in stores. This rapid pace of introduction has many video service providers planning and implementing the network, CPE and operational systems to launch UHD services. ARRIS can help make the migration to UHD seamless for service providers, with phased evolution strategies and innovative technologies that can be deployed incrementally and grow with demand. From 4K content distribution for programmers, to video processing and encoding to network infrastructure and CPE, ARRIS combines the right technologies with the expertise to put them all together, ensuring that service providers are equipped to evolve from initial trails to efficient, reliable multi-channel, live and on-demand, UHD services. As a leader in video solutions for over 60 years, ARRIS has been through sweeping technology changes before. We invented digital TV and helped lead the industry through the transition from SD to HD and we are applying many of the lessons learned to the migration to Ultra HD as well. IRDs that allow Programmers / broadcasters to distribute content in 4K Ultra HD. Deploying HEVC compression technology cost effectively, the ME-7000 modular encoder is capable of transcoding 24 channels of 4K Ultra HD live TV to HEVC, all in a 1 RU, saving in rack space, power and aircon. Ensuring sufficient network bandwidth is available for UHD content. Optimizing video delivery with sophisticated video-quality and bandwidth management techniques. Transitioning to flexible all-IP video (Adaptive Bit Rate – ABR) delivery models for UHD. A portfolio of UHD / HDR set-tops with a choice of software platforms and User Interfaces. Optimizing Wi-Fi for UHD video delivery with the ARRIS HomeAssure Wi-Fi connected home solution. ARRIS offers the products and services to simplify and accelerate the introduction of Ultra HD services, including multiple live TV channels. With the ARRIS portfolio of Ultra HD capable set-tops your consumers can experience the essential elements of UHD video: high-frame rates, wide color gamut and high-dynamic range (HDR). We support the common HDR standards, including HDR10, HLG and Dolby Vision™. The ARRIS HomeAssure wireless connected home solution provides robust, high-performance Wi-Fi to reliably deliver premium UHD channels to Wi-Fi connected set-tops, in every corner of the home. High-Efficiency Video Compression (HEVC) and high-density IP statistical multiplexing enables as much as a 50% gain in bandwidth utilization. 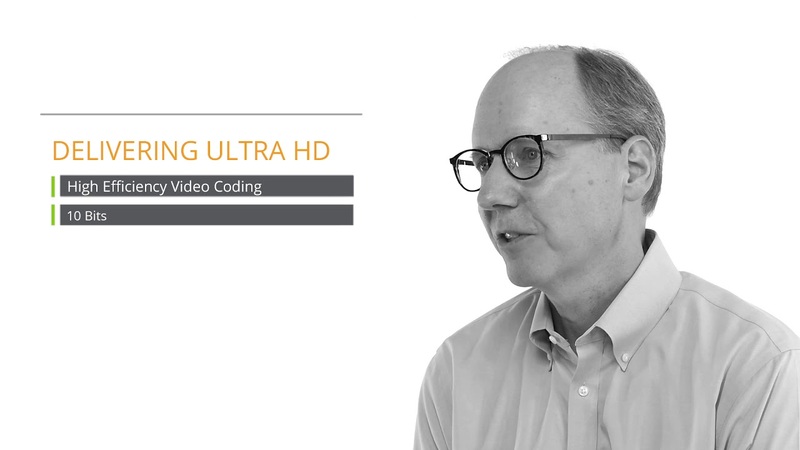 These technologies provide a critical foundation for the efficient delivery of UHD content. enables as much as a 50% gain in bandwidth utilization. All ARRIS UHD set-tops support HEVC decode. ARRIS offers flexible, modular transcoding hardware solutions. The ME-7000 encoder/transcoder, is capable of transcoding 24 channels of live UHD TV in HEVC, all within 1 RU of rack space. Saving space in the video headend as well as significant OPEX cost reduction though power and aircon savings compared with software only transcoders. Programmers, broadcasters, content owners can optimize content distribution by utilizing a single UHD version and transcoding to HD and SD at the service provider's headend using the DSR-7400 Series Integrated Receiver Decoder (IRD). It is also capable of converting HDR content in the HLS format to standard dynamic range. Kevin Wirick leads product marketing for the ARRIS video networks business, which is a leading supplier of video compression, processing and interactive video networks to video service providers and content programmers. In this role, Kevin analyses customer's future needs and develops product strategies and programs that make customers successful with ARRIS products and solutions. He has worked extensively with video compression and networking technology, and holds several patents in these areas. Kevin holds a MSEE from the University of Southern California and a BSEE from Bradley University.